Raipur: After the successful launch of the Art of Performance tour in Aamby Valley, followed by Pune, Ahmedabad, Indore, Jaipur, Gurugram, Karnal, Chandigarh, Noida, Lucknow, Bengaluru, Chennai, Vijayawada, Hyderabad and Nagpur, Jaguar brings its exhilarating drive experience – The Art of Performance Tour to Raipur. This dynamic tour will give customers the opportunity to experience what it is like to get behind the wheel of a Jaguar under the guidance of expert instructors. Guests including, prospects aspiring to own the iconic brand, will experience Jaguar’s unique offering that combines exhilarating performance in an ambience of seductive luxury that truly excites the senses. The entire range of Jaguar vehicles, the XE, XF, XJ, F-PACE and F-TYPE, will be available for the guests to experience. The event entails a series of specially designed track exercises on an open tarmac. The event is scheduled on 28th & 29th October at Naya Raipur, Sector 4, Riko, Chhattisgarh. The Jaguar range in India includes XE (starting at ₹ 35.85 Lakh), XF (starting at ₹ 46.46 Lakhs), F-PACE (starting at ₹ 70.67 Lakh), XJ (starting at ₹ 100.80 Lakh) and F-TYPE (starting at ₹ 215.35 Lakh). All prices mentioned are ex-showroom prices in India. 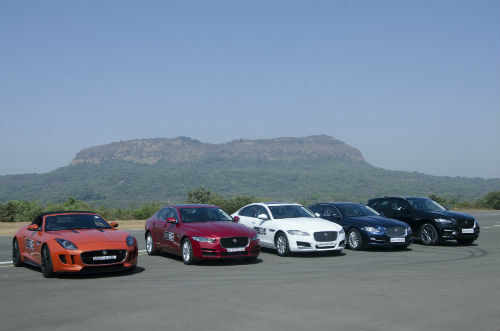 Jaguar vehicles are available in India through 25 authorised outlets in Ahmedabad, Aurangabad, Bengaluru, Bhubaneswar, Chandigarh, Chennai, Coimbatore, Delhi, Gurgaon, Hyderabad, Indore, Jaipur, Kolkata, Kochi, Karnal, Lucknow, Ludhiana, Mangalore, Mumbai, Nagpur, Pune, Raipur and Noida.